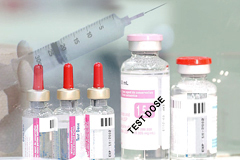 Eighty four percent of those receiving the Anthrax Vaccine have had adverse reactions. The FDA has not approved this as an authorized vaccine, yet we are spending 5.6 billion dollars on it's manufacturer. Military personnel have been refusing to take the vaccine because of the side effects, even at the risk of court martial. What does that say to you?